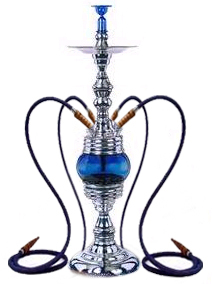 The Python Multiple Hose Hookah is the first type of Hookah model to be fully customized for today's Hookah smoker. This Hookah has been designed with superior craftsmanship for complete authenticity and quality. The Python rotates a full 360 degrees to allow for durability and flexibility with the individual Hookah smoker. The Python may always be converted depending on how many users are available. This Hookahs durable design allows for ease with setup and maintenance, while providing entertainment for years to come.